Borne out of love of game, Compounded by lack of game. This website is the product of an idea. It was brought about by the love of the game, by someone who is not that good at the sport, and was looking for “something else” to do in his post-career life. The site was started while looking for bowling alleys with tournaments, in various cities that were going to be visited on vacations and other travel. Finding easy to access and reliable lane data was the first issue. Immediately I saw that a tool that made this easy was needed, that had everything in one place, at hand, and easily accessible. There were several websites but none was very accurate and, especially, up to date. This is when the Bowling Alley Locator was started. 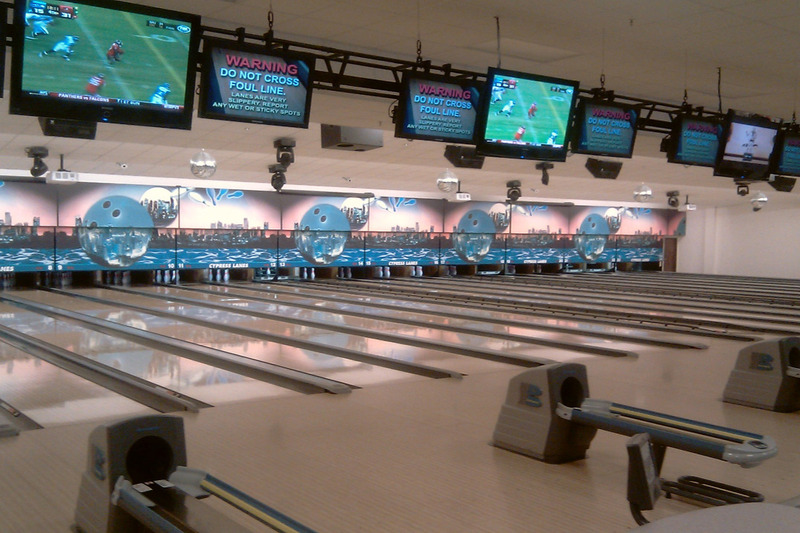 To do this, data had to be gathered about as many bowling alleys as possible, distilled, and formatted, to fit the new location system. Once the facility database increased to over 5000 entries it was better hosted on the web . From there it grew. The focus of the operation is to provide the best adult bowling tournament listings for folks who bowl, and/or, are interested. 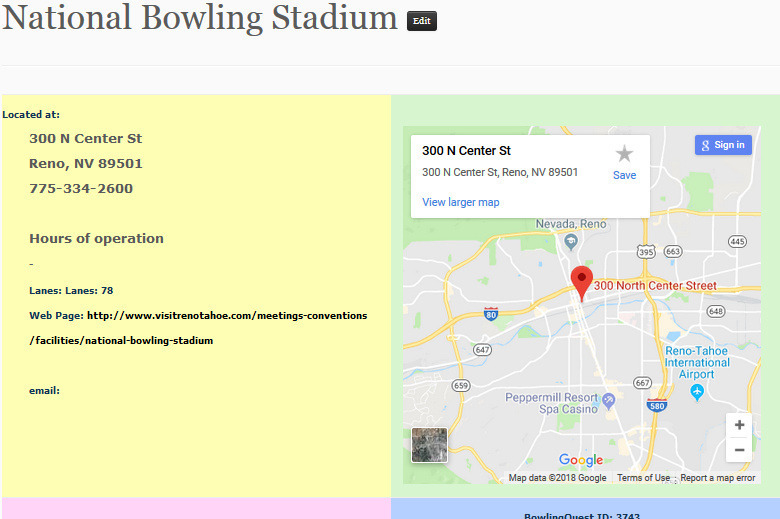 BowlingQuest has THE Most Accurate, Up-To-Date, Bowling Tournament Locator, Finder, Calendar, and Bowling Alley Information available Anywhere! In addition, there is a rating system for facilities where you can evaluate the facility according to 5 categories. The ratings are summarized on the site for your scrutiny. Items like parking lot security and quality of lanes and equipment are graded here. At present, the site has more than 6000 facility listings and hundreds of tournaments. This campaign is about moving forward as well as recouping out of pocket expenses. BowlingQuest.com has been on the internet since 2013, with almost constant work. It is the idea and creation of one person, who designed, developed, and built, what you see, from near scratch. Expenses have included hosting, domain fees, work farmed out, as well as development time. The project speaks for itself, it doesn't fund itself. Have a look at it. There's more to be added. The Bowling Tournament Calendar was also borne out of need, when I ran in to the same issue tournament hunting. There was just no up to date calendar. So a pre-made plug-in for WordPress was used, a great, and very customizable tool available through the WordPress plug-in base itself, to display the events. 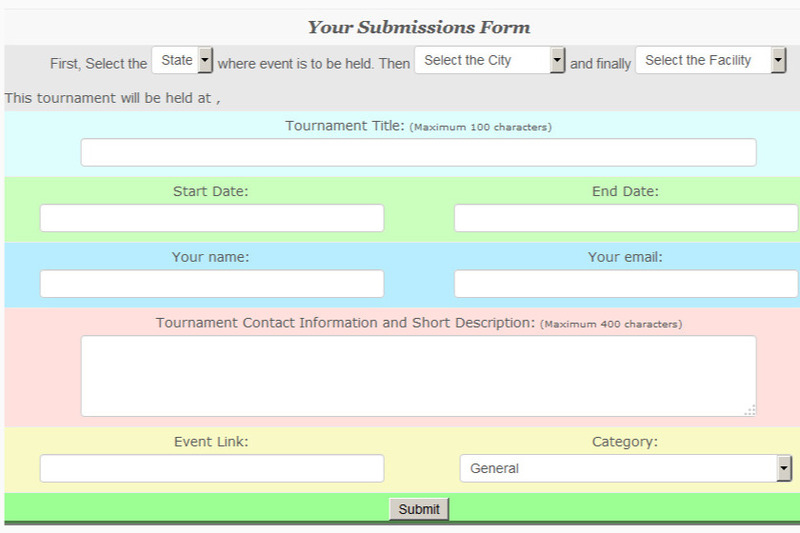 For event submissions I built a simplified Submissions Module where anyone can enter their tournaments For Free. It's fast and easy to use. Combining that with the lane information was a natural, such that each facility page shows the lane information along with tournaments listed in the calendar for that facility, if any. An integrated system! 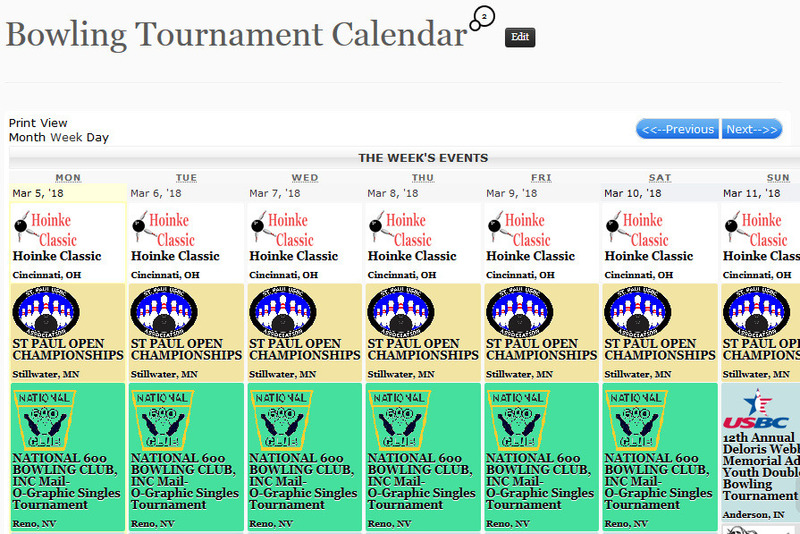 Below are shots of the BowlingQuest Bowling Tournament Calendar , Submissions Module , and more. 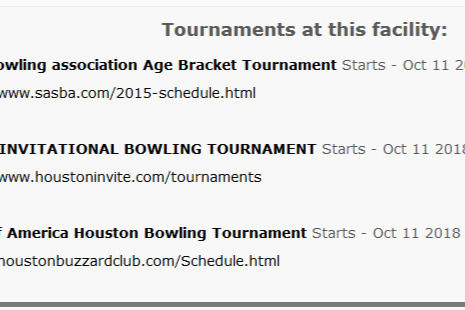 The Submissions Module is where you can input tournament events to be approved and displayed on the calendar. The submissions module that came with the calendar was overkill, so I designed my own, to make it easier for the user. Input is handled mostly with pull-down menus. Even the date is set with a calendar such that you don't have to write in a date. It's easy and especially, FREE. 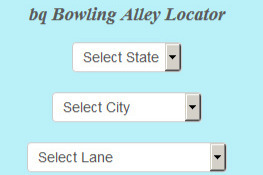 Along with the Calendar, the bq Bowling Alley Locator is an integral part of the operation. I designed it to allow the user to choose the state, city, and facility location easily from drop-down selections, of over 6000 listings, and to take one to the page that is dedicated to the selected facility. This page will have tournament listings, if any, for that facility along with other information. Below is a sample page that has the facility information and basic map. Below the facility data are the Tournament listings that for facility that ate listed in the calendar. Each entry is linked to the tournament pages themselves. By clicking on a listing, one can get needed information about the event from the event directly from the perpetrators. This can include entry forms, regulations, and details about the actual tournament. And there's constantly updated News, articles, and lots of other "stuff" relative to tournament bowling, from history to other forms of the sport. So, how about showing some love for BowlingQuest.com and Donate. It's all about what you see here. No scams. No trash. This is a work in progress and it ain't free. Trying to make a great product even better. Need your help.